The poems of Self-Portrait with Crayon are haunted. There are no ghosts or goblins lurking, but rather an absent mother and Edgar Degas. It is not only the content of White’s poetry that is haunted, but also the approach. The thirty-five prose poems are fragmentary, only filling in some of the details. Even the definitions of words are slippery, often losing their established meanings to take on White’s. Although a few of the details from the speaker’s childhood seem sentimental, they create a believable character. 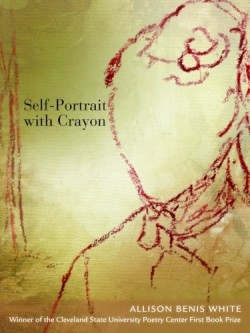 As the title suggests, Self-Portrait with Crayon draws a portrait and introduces a promising young poet. While individual poems have appeared in well-known journals, this is White’s full-length debut. It won the Cleveland State University Poetry Center First Book Prize. Using paintings, sculptures, and drawings of Degas lends the poems imagination to complement the melancholy at the collection’s core. For example, “La Savoisienne” allows the speaker to project herself onto the unnamed peasant that Degas rendered. White proposes what might happen to the girl beyond the painting. In this way, the poet gives life to a figure as she gave life to a hanger. Both peasant and poet believe “There are at least seven kinds of loneliness.” But is it White who breaks the long silence and gives voice to the lonely and the absent—herself, her mother, and Edgar Degas.